Tab General - Here you can specify a number of settings to customize displaying, editing and SQL statement processing features in SQLyog. Generate queries using backquotes: Checking this option will enclose table and column names in backquotes like `table`.`column` when SQLyog generates queries. This option has effect for the Query Builder and for 'Paste SQL Statements' (in the table menu). Keep focus on SQL Editor after query execution: Checking this option tells SQLyog to remain focused on the query text after the query execution; otherwise the focus will be automatically switched to the Result Tab to show you the results of the query execution. Prompt if a tab with unsaved changes is closed: With this option on, SQLyog will warn you if you are trying to close an Editor/Query Builder/Schema Designer tabs without saving latest changes. Paste object name in editor on double-click: Use this option to have an object's name automatically typed in the SQL window when you double-click the object in the Object Browser. This will allow you to avoid misprints. Enable Word Wrap in SQL editor and BLOB viewer: Text data will be word wrapped in SQL Editor and BLOB viewer in Data Tab and Result Window. Format JSON data in JSON viewer: Checking this option displays the JSON data in a formatted way in the JSON viewer. Note, this option will be disabled by default. Enable transaction support for batch process: If you check this option, all DML statements will be wrapped in a transaction. On transactional engines(InnoDB, PBXT), this will ensure that the DML-statements(between SET and COMMIT) are 'atomic'. ie. it gets done completely or it does not get done at all. Inside transactions DML is not written to the database but to a log. Only on COMMIT the log will be applied to the database. Note that, this option works only with * GUI functionalities*: 'Copy Database', 'Database Synchronization', 'Import External Data'. This doesn't apply to the DML statements written in a Query Editor. But you may course handle a transaction yourself from the editor. Also when executing a SQL-script from an external file (menu .. tools .. Execute SQL script) the script will be sent to the server as it is. So the script may use transactions or not. SQLyog does not change the statements contained in the script. Note that DDL statements generally cause an implicit COMMIT in MySQL. Also if the global server setting is AUTOCOMMIT = 0 (what is very rare with MySQL) user will have to COMMIT manually after DML statements. Force disable FK check throughout HTTP import batch process: Selecting this option, it will have same effect when importing external files with SQLyog (from Tools ... Restore from SQL dump) over an HTTP-connection. It is selected as default. Show Warning(s) in Message tab: Selecting this option displays warnings automatically after execution in MESSAGES tab. Note: this is not implemented for HTTP-tunneling. Halt Execution of Queries on Error: When running multiple statements in the editor and an error occurred, SQLyog would continue to next statement. This option will allow the user to halt the query execution on encountering an error and not proceed to the next query when this checkbox is checked. Date picker shall set server time: SQLyog will fetch the date and timestamp of the server in the date picker dialog when this checkbox is checked. This checkbox is unchecked by default. -- Max. size (in KB) for BULK INSERT statement(s): The DUMP (SQL-file) will contain INSERT statements with the (textual) length as you specify here. The option to 'get server default' will use the 'max_allowed-packet' setting for the actual server. 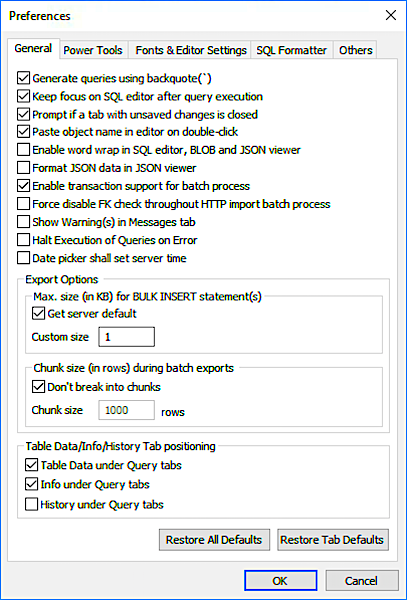 -- Chunk size (in rows) during batch exports: When this option is selected SQLyog will not retrieve all data from the server in one query but will instead send a series of queries and for each get the number of rows you specify. This can be required to avoid various types of timeouts (for instance the default MySQL configuration is to allow only for 60 seconds to send result. If it takes longer than this server configuration setting the server will drop the connection). Note that with HTTP tunnel a CHUNK setting of 1000 rows will always be used unless you specify a lower value. Table Data/Info/History Tab positioninger: This is an option to change the position of Table Data/Info/History Tab to either the Upper pane or Lower pane. Tab Power Tools - This tab is for configuring and enabling/disabling the Autocomplete feature. Tags Directory - The option to specify (storage position for Autocomplete files is primarily intended for use on networks where 'roaming profiles' are stored on a domain server. Specifying a local folder will reduce network traffic and save storage on the server. Query Profiler - With this feature enabled every SELECT statement will trigger execution of EXPLAIN (EXTENDED) and SHOW PROFILE (if supported by server) for the query and will detect changed SESSION STATUS VARIABLES due to execution of the query. 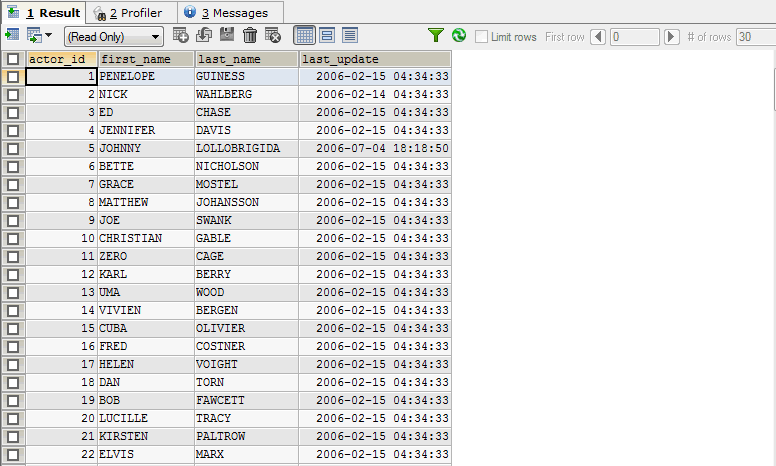 The information will display in an 'Profiler' tab opening in the DATA/RESULT area. Here you can setup fonts and colors of your SQLyog environment for your absolute convenience. 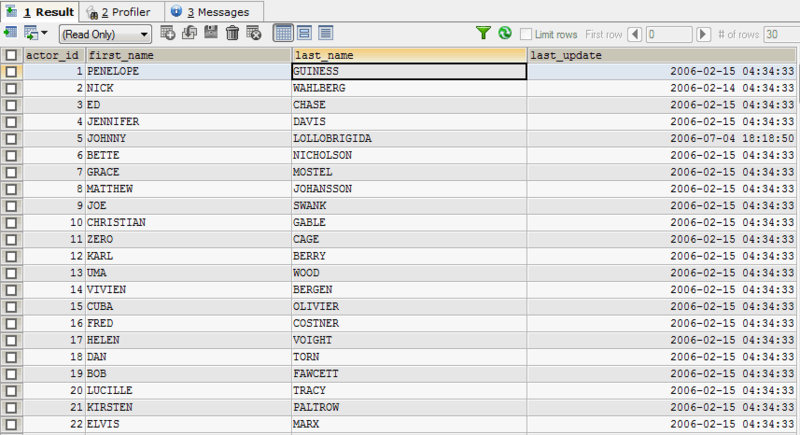 Tab SQL Formatter - Here you can specify a number of settings to customize formatting and displaying query in SQLyog. 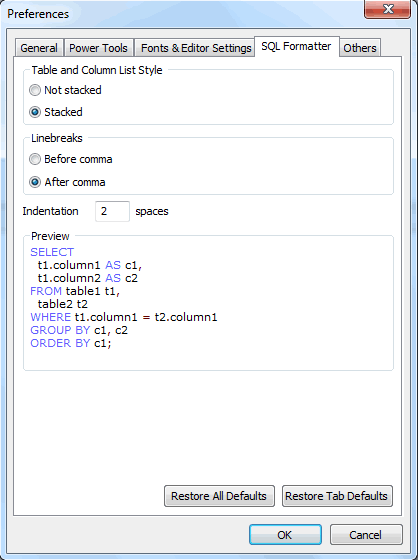 Table and Column list style - Selecting 'Not stacked' or 'Stacked' can be used to insert line breaks in editor such as before or after commas, SQL keywords, Aliases etc. 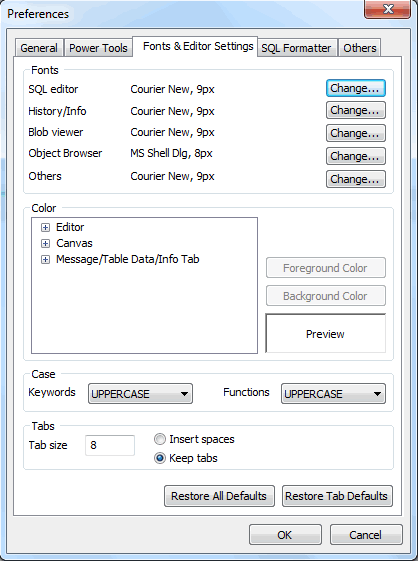 Tab Others - Here you can specify a number of settings to customize displaying and editing data in SQLyog. Retain user modified column width: Checking this option, you have defined a column width for a combination of database/table/column the defined column width will always be used. Note that connection details are not used for identifying columns with this new functionality so with replicated and identically named synchronized databases it is sufficient to define in one place. Alias'ed columns in results are handled by the column name and not the alias. Non-column results (like constants, results of expressions/functions, returns of SHOW etc.) are not supported currently. The feature can be turned on/off. Note that if both this new option and the old "Truncate column headers to maximum data size" is checked the "Truncate..." option will be ?‘overriden' by the new column width persistence feature. Truncate Column Headers To Maximum Data Size: Checking this option will result in column widths of max. data size in Result Window and Data Tab. If you have this option unchecked, SQLyog uses an intelligent calculation to set the width to either column name or data size. 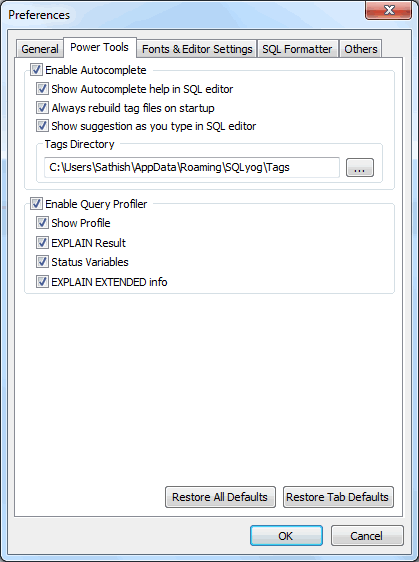 Restore session on startup: Checking this option will restore your previous session along with all the query tabs and the history tab the way you left it. 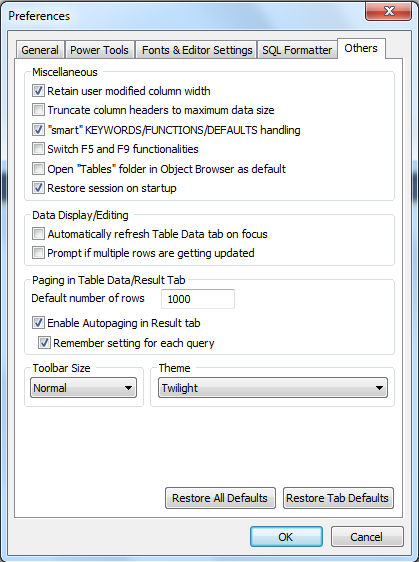 Automatically refresh Table Data tab on focus: Checking this option makes SQLyog automatically refresh Table Data tab when it is focussed. Prompt if multiple rows are getting updated in the Data display/editing section: If editing data results in multiple rows getting updated then SQLyog will warn you and ask for confirmation. If you don't want the warning, then you need to uncheck this option. Enable Autopaging in Data/Result tab: By checking this option you can define if you want the result set of a SELECT query displayed in pages RESULT tab and the default number of rows that is displayed. If the option to 'Remember setting for each query' is checked the latest number of rows fetched will be stored and used whenever a SELECT query fetches data from that database and table (in current session or next session). Note that the number of rows (only) is stored and persistent - the 'offset' value is not. Also note that the query string itself, the database context and the table - but not the connection details - defines this setting uniquely for each query. Theme: This is an option to change the look of SQLyog. All you have to do is pick one from a dropdown list.